Hollybeary Creations : TTS#33 All that Glitters is Gold! TTS#33 All that Glitters is Gold! Time for our first new challenge of the year at 'Tis the Season.. Ha Ha I bet you didn't think you'd be seeing any Christmas Cards from me for awhile huh? We'll we are starting things off right at 'Tis the Season and this is a great way to get a jump on those cards and be ready for November! This week it's a Color Challenge and we're using Blue, Orange & Gold. I went with a little watercoloring for my card. Dawn at Wplus9 does some amazing watercoloring with their stamps. I've always been a fan of watercoloring I did a lot of it in art class in High School and College but somewhere along the way I put it aside. I'm glad I picked it back up again along with a few other artistic hobbies. 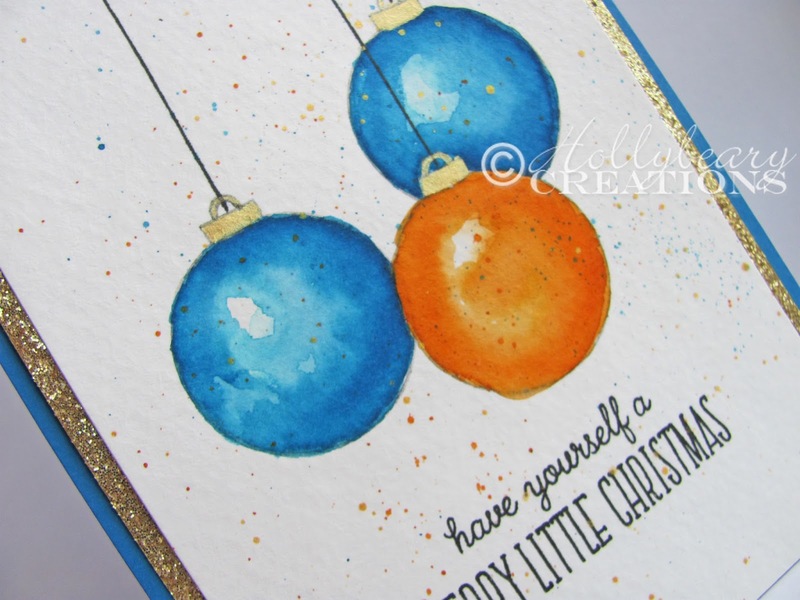 I stamped the ornaments from the WPlus9 set Merry Little Christmas onto a piece of watercolor paper using some Black Soot Distress ink.. I did third generation so it would be light. Then I colored in it with some Pacific Point & Pumpkin Pie ink refills. Then I used some gold ink thinned out with a little water for the tops of the ornaments. Once everything was dry I added a few splashes of the Pumpkin & Blue color and some Gold spray. Then I stamped the strings and sentiment from the same set with some black ink. I trimmed the panel to the size I wanted and added some strips of Gold Glitter paper along each edge and adhered it to a Pacific Point card base. 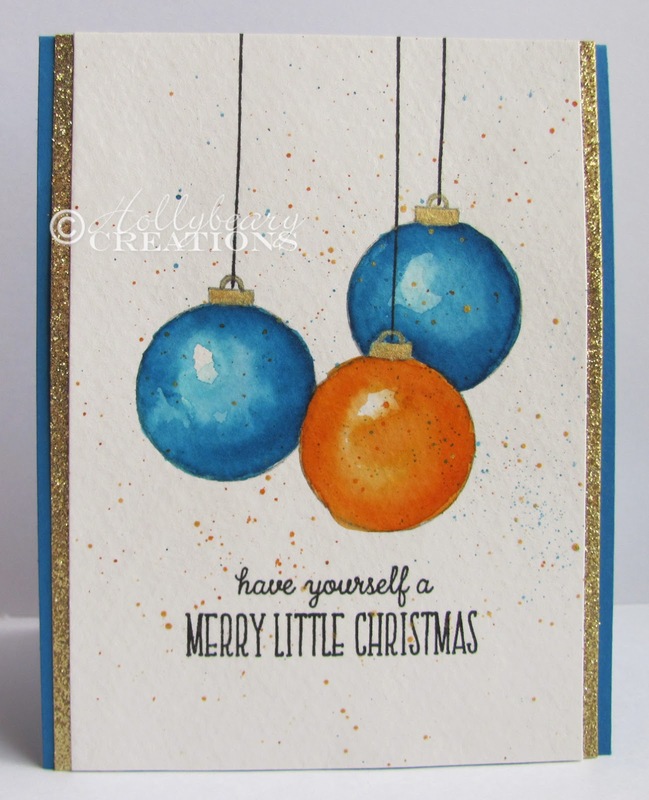 This is a card I will make more of in other colors very soon it's so simple looking but very pretty. 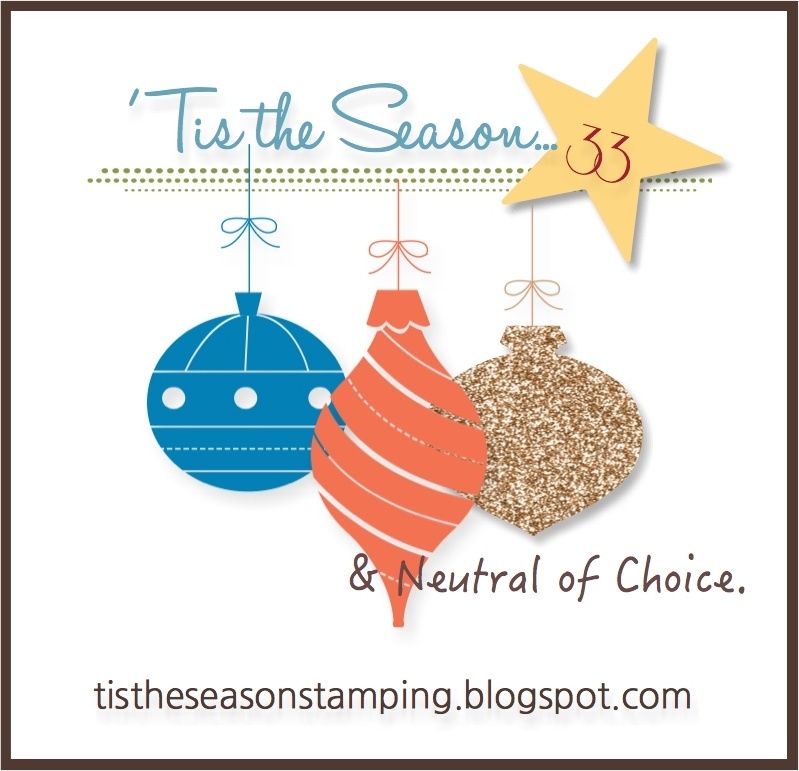 Be sure to head over to the 'Tis the Season blog and see what the other Design Team members created today and Link up with us.. We'd love to see what you are creating with the challenge colors.